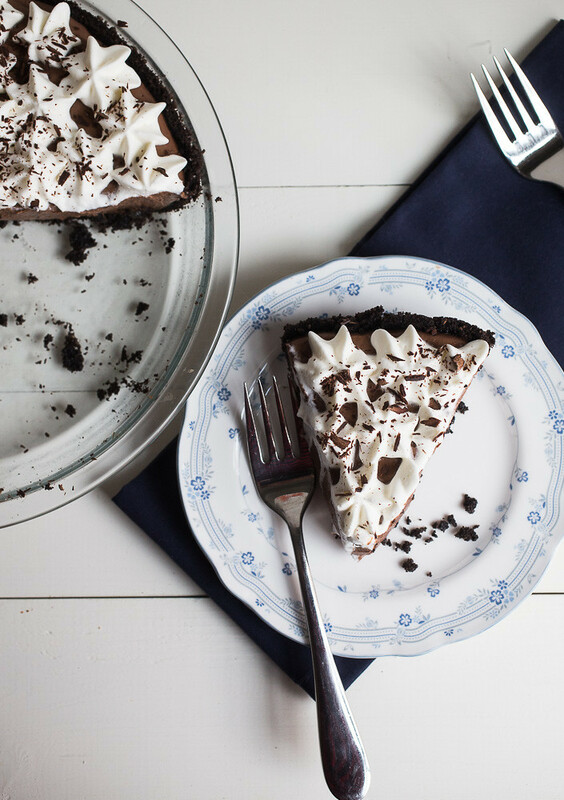 Chocolate cream pie – Thick, rich, velvety smooth, and intensely chocolatey filling with an Oreo cookie crust and fresh whipped cream, this pie is what dreams are made of. Isn’t it funny that for no reason at all, there are certain foods you just never try? 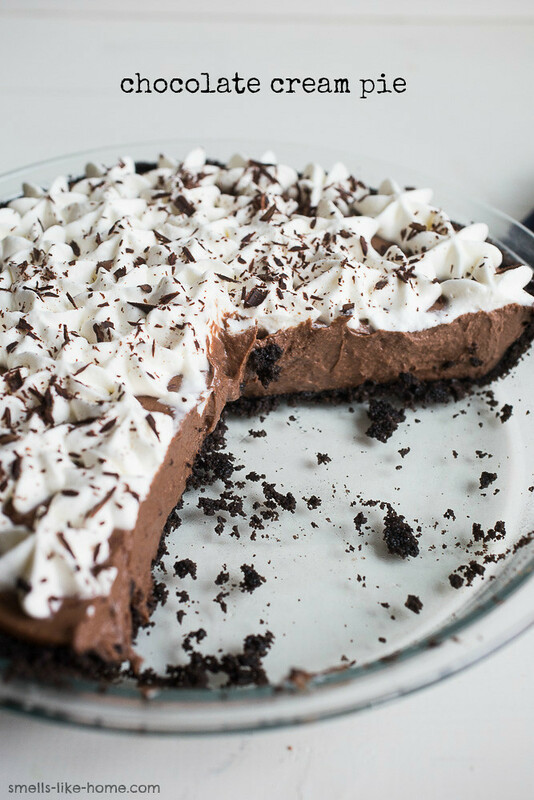 Take for instance, chocolate cream pie. When I’m faced with a smorgasbord of holiday desserts, including no less that 4 different pies including an apple slab pie and probably a cheesecake, chocolate cream pie just isn’t the dessert I gravitate to. It never has been. But that all changed when our friends, Ron and Rosy, brought a chocolate cream pie to our house for dessert one night a few years back. They brought a pie from Rosy’s bakery/café/restaurant and it was INSANE. Mounds of thick whipped cream piled atop of a velvety smooth chocolate cream filling that pushed the limits of almost being chocolate mousse. Needless to say, I stopped by Rosy’s place the morning of our anniversary just a few months later at the very beginning of a freak October snowstorm. I needed to pick up another one of those pies. Desperate times and all of that. And after hemming and hawing for 3 years, I decided last year it was high time I made my own. In the intervening years of Rosy’s first pie and this one, I’ve tried a few other versions at restaurants and other bakeries. And to my great dismay, I’ve found many of them to have a gloppy, pudding-like filling that completely turned me off. The one is different! 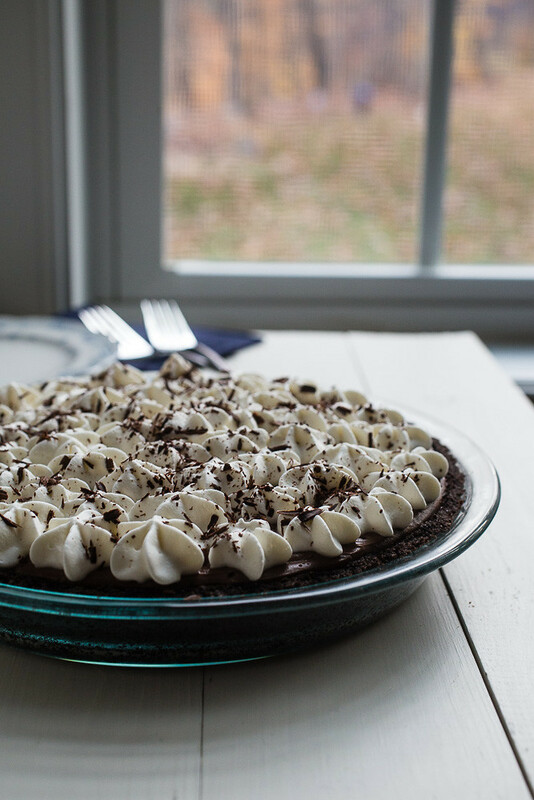 With the addition of a chocolate cookie crust and some fabulous whipped cream that won’t run after a day of being in the fridge, I might just be able to say that I’ve found a new favorite pie. Well, a new favorite non-fruit pie because, well, apple slab pie will never go out of style. After making it 4 times in last 12 months (yep), I’m still completely over-the-moon excited about this chocolate cream pie!! The chocolate cream filling is absolutely perfect – thick, rich, velvety smooth, and intensely chocolatey. It’s basically a luxe chocolate pudding that holds its shape when you cut into it. I’ve seen plenty of chocolate cream pies made with a traditional pie crust and I tried this myself with my very favorite all butter, really flakey pie dough. But you know what? How is that even possible? I adore that pie dough! But there was something amiss with the textural differences between the crust and the filling. The crumbly cookie crust was a MUCH better complement of texture to the creamy chocolate filling than the flakey pie dough was. Leftovers will keep well for about 2 days in the fridge covered with plastic wrap; thereafter, the crust gets soggy but the filling and whipped cream are still delicious. I would not recommend baking and freezing this pie in advance. To make the chocolate crust: Adjust an oven rack the center position and preheat the oven to 350° F.
Crumble up the cookies with your hands and add them to the bowl of a food processor. Pulse 5 times then let the processor run for about 15 seconds. Drizzle the butter over the crumbs and process for another 15 seconds, until the butter is evenly distributed. Transfer the buttered crumbs to a 9-inch glass pie plate and press them evenly on the bottom and up the sides (a measure cup works really well for this). Chill the crust for 20 minutes. Bake for 12-15 minutes, until the crust smells great. Cool completely on a wire rack. To make the chocolate cream filling: Measure the sugar into a small bowl. Add the half-and-half to a 3-quart sauce pan along with 3 tablespoons of the sugar and the salt. Bring the milk to a low simmer over medium-high heat. While the milk warms up, whisk the egg yolks, cornstarch, and remaining sugar in a bowl until no lumps remain. Once the milk reaches a simmer, turn off the heat and quickly whisk in 1 cup (or about 2 scoops with a large ladle) of the milk as you slowly pour it into the bowl. Turn the heat to medium and whisk the warmed eggs into the milk in the sauce pan; continue to whisk vigorously until the mixture thickens and starts to bubble. Remove the pan from the heat and whisk in the butter and all of the chocolate until completely melted, then whisk in the vanilla. Pour the chocolate cream filling into the prepared crust and immediately cover with a piece of plastic wrap pressed right up against the filling to prevent a skin from forming on the filling. Refrigerate for 4 hours. To make the whipped cream: Chill a large bowl and the whisk attachment to a stand mix or hand mixer for 30 minutes. Beat the cream and sugar together at a gradually increasing speed up to high for 2 minutes. Add the vanilla and continue to beat until stiff peaks form, another 1-2 minutes. Spread all of the whipped cream out over the fully chilled pie, use a piping bag for decorating with the whipped cream, or serve it separate with single slices of pie. This cream pie looks so scrumptious!! I adore a good chocolate filling! Me too! I can definitely see this filling happening in other recipes too since it reminds me of a chocolate pastry cream. Thanks, Sammie! It is really easy to make! omigosh YES this is what I’ve been missing in the land of chocolate cream pie! So I made this. There are no words to describe how delicious this pie is. My husband, who is not a sweet eater, inhaled this and in between mouthfuls, declared this as THE best dessert he’s ever had. It was a sad day in our house when the pie was gone. LOL. Thank you once again for a killer recipe.